Still the best stage effect I've seen. During the "I get up I get down" close to the edge section, dry ice rolling down steps at the front of the stage. laser shining up to a mirror ball reflecting strips of laser cascading on the dry ice giving a waterfall effect. 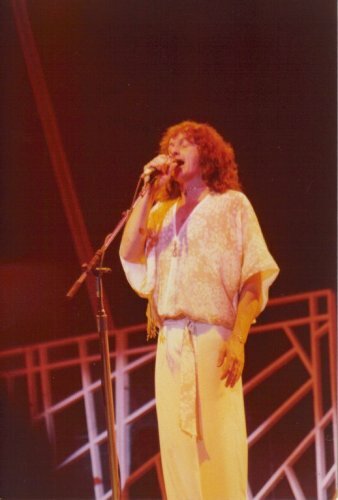 Sound Chaser is right, John -- you must have attended a 1979 show when "Perpetual Change" was part of the "Big Medley". Phenomenal!! THEY DIDN'T DO PERPETUAL CHANGE AT THIS SHOW. 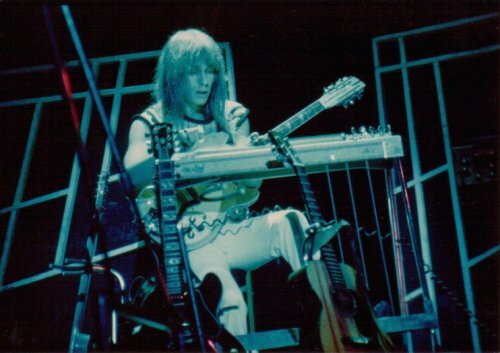 I don't remember which of the October 1977 London concerts I was at, but my best memory was Perpetual change. 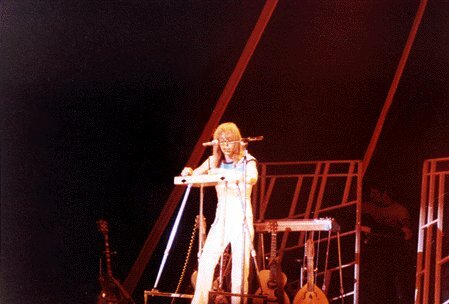 Rick Wakeman returned to the stage, tapped a note and the entire audience roared. Another note and another roar. 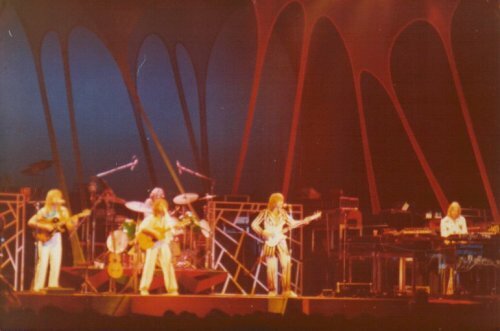 After several notes and roars the band came back onstage and performed Perpetual change. 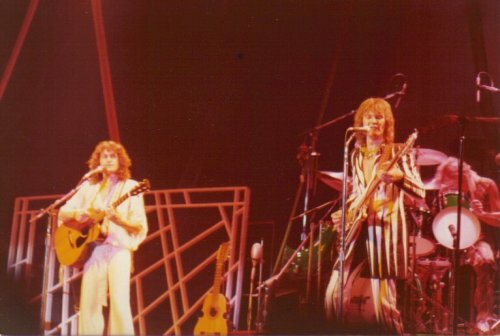 As far as favourite experiences go, I think I will have to elect for my first ever Yes concert experience, way back on Monday 24th October 1977, when I was just a fresh faced and innocent 16 year old. As this was a school day, I remember having to get out early, and my Dad being persuaded to collect me from the school gates, drive me the three miles home, and wait while I transformed myself from my school uniform clad self, into my junior hippy Yes regalia (Yes Logo T-Shirt, patched and decidedly flared jeans, and musty and rather unpleasant smelling Afghan coat - quite an impressive sight I can assure you, so pleased I was very camera shy in those days!). After the drive back to the station, I was on my way, London bound. Of course in those days it was easy to find fellow fanatics to travel with, even at the height of Punk, and I recall a crowd of about ten of us making the 30 mile trek together. 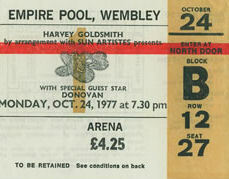 The excitement at the then named �Empire Pool� (later to be transformed to the anodyne �Wembley Arena�) was tangible. My abiding memory of the equally well dressed throng was that every second person was sporting a luminous green neon band, either round their neck or head. To my teenage eyes this was a truly special sight, and I had to have one, needless to say the luminescence lasted only about four hours! I remember waiting impatiently through Donovan�s set, and to this day I do not understand the need for a support band. 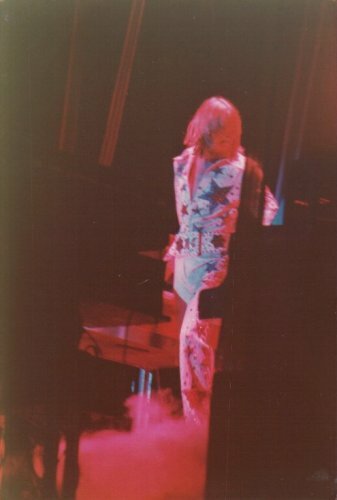 Eventually though the lights dimmed and the opening strains of Firebird sounded, sending the crowd into raptures of cheering and applause, and then everything went crazy as the lights came up and we were grooving to Parallels. It was magical to be so close to these musicians who I had worshipped for so long (4 years used to pass a lot slower in those days! ), and the next 100 minutes passed over me in a blur. The green lasers refracting over the crowd were special, this was a first in my gig experience. I had no idea of the set list in those pre www days, so hearing Close To The Edge was a dream come true. Before I could draw breath though they were finishing Roundabout, and it was over. The journey home was full of excitement as we eagerly picked over every last detail, pored over the programme, and naturally looked resplendent in our luminous green neck bands. 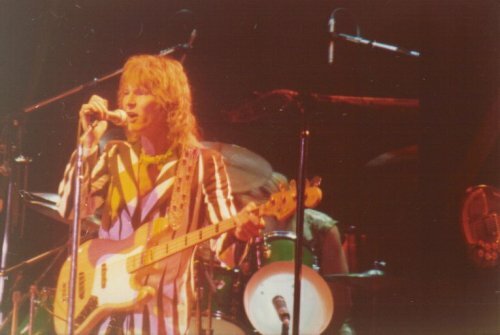 It was thankfully only a year until the next opportunity to re-live the Yes live experience, and that was an epic show, but nothing can beat the pure adrenalin rush and fever pitch excitement, that was that night in London, 23 years ago next month.